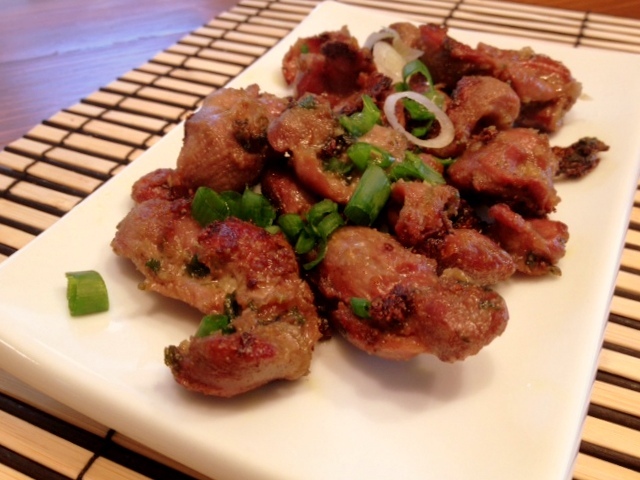 Yep, here is another easy, inexpensive, yummy gizzard recipe! 1. On a non-stick skillet, melt the butter then put in the chopped garlic, scallion and ginger. 2. Once the garlic starts to smells good, throw in the gizzard, chicken stock powder and pepper then cover the skillet for around 10 minutes. Stir once in awhile. In this stage, the gizzard should release a lot of water. 3. Poke the gizzard to see if its tender enough to your taste. 4. Once the gizzard is tender enough, remove the skillet cover and let the water evaporates. Let the gizzards dry and have a nice red bronze glaze, and the garlic and scallion turned into crispy crumble caramelized in butter. 5. Serve as appetizer, meal or even snack, sprinkle the chopped scallion and enjoy! PS: you can use chicken heart as well instead of chicken gizzard!